"I had a fire, and I had an accident," says the man on the phone. He's not telling the half of it. He and his wife and two pre-school boys are newly homeless --- and holed up in a room-by-the-week motel in the northern Finger Lakes. The family's story is a classic "one thing after another." First a fire took their home; insurance didn't cover it. Then a serious ankle injury cost the man a $20-plus-an-hour job. "I was trying to put the house back together as fast as I could," says the man, a painter by trade. "Then a table [fell and] put me out of commission." He says he couldn't get workers' comp. "It don't take long," he says. "You're out for a year, and you're done." The leg still causes him pain, but he has to find odd jobs. "I still have to work," he says, even at $7.50 an hour. "What are you going to do?" The motel room, he says, goes for $192 a week, tax included. That's enough for a decent apartment. "But we can't come up with the security," he says. "I've always been productive, but this last year's been hell." He plans to head south on a job search as soon as he's on his feet: "The Upstate area, we're going to have some tough times ahead." This story is repeated endlessly in the "richest country in the history of the universe," of course. But it's still significant --- not just on its merits, but because it's happening away from the inner cities. There's an "invisible" rural homeless crisis in the US, in fact. This crisis recently made headlines in the Christian Science Monitor. "A sobering new reality for small-town America" is upon us, said the paper. 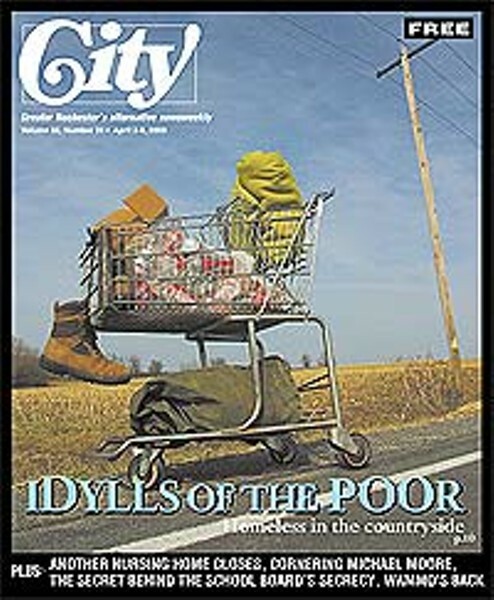 "Homelessness... is creeping into rural areas, but without the services available in cities. Small towns typically have no shelters and few social workers. That leaves churches, community groups, and volunteers to fill the void." The Monitor looked at communities not so different from Upstate cities and towns. Take Crystal Lake, Illinois, population 25,000. On a recent Sunday, said the Monitor, one Crystal Lake church served dinner to 45 homeless and poor people, of whom 39 "spent the night." The vignette points back to the Finger Lakes --- specifically, the Geneva Center of Concern, a mostly volunteer group that distributes food and sells second-hand clothing to low-income people in this small city and nearby areas. Cheryl Toor, the Center's manager, is helping the homeless family of four that's stuck in the motel. Her work starts with the mundane. "We're looking to find them a slow cooker, or anything like that," she says. The motel room has no kitchen, she says, so the family's been using a George Foreman Grill and a coffee percolator for heating up meals. Toor adds she often brings up such problems at weekly meetings attended by representatives of the Red Cross, the Geneva Food Pantry, Ontario County social services department, and other agencies. The inter-agency meetings allow hands-on workers to share information and help each other tackle the problems. A slow cooker is one thing, but there are bigger fish to fry. "As far as providing the rentals, hotel rooms, the funds aren't there," says Toor. She says Geneva-based agencies like the Salvation Army and Red Cross can help for one or two nights. But sometimes people, though their incomes are low in absolute terms, make comparatively too much to qualify for transitional assistance. She says she regularly runs into "someone who's completely outside the [income] guidelines --- it may be only by $10." Is there a saving grace? "They're bringing back the federal food," says Toor, referring to the USDA surplus program for commodities like cheese and canned goods. Indeed, the Center of Concern's shelves and freezers hold USDA canned meat, butter and margarine, and other staples. The city of Hornell (population 9,000) looks more stressed than Geneva. And where Geneva gets an economic and cultural boost downtown from Hobart and William Smith Colleges and upscale lakeside properties, Hornell has been tracking up and down with industries like ALSTOM Transportation Inc., which produces railroad vehicles. Moreover, Hornell lies in the Southern Tier, whose counties --- Steuben, Allegany, Cattaraugus, and others --- are among New York's poorest. So how are the homeless doing there? "I have five cases [so far] this week," says Roger Miller, envoy (officer in charge) of the Hornell Salvation Army office. "The average now is eight a week, up from five last year, and three the year before." He echoes providers elsewhere in the region: "Services are nearly non-existent. In rural areas, you don't have the advantage of shelters." Miller says he tries to get people into very temporary lodging, and he helps with utility bills. But without actual shelters available, where are people going? Are they disappearing, physically and statistically? Briefly, they're moving in with friends, or maybe with anybody. "We've had cases in recent weeks like a two-bedroom house with 16 people, full-time residents, two to three or six unrelated families," says Miller. Technically, the unit is rented in the name of only one family, he says. So if landlords get wind of the situation, somebody's going to get evicted. In any case, these ad hoc arrangements are unstable. "The Smiths don't get along with the Joneses," says Miller --- and thus, even without a landlord's intervention, a tenant can be thrown out and rendered homeless all over again. Miller describes another, all-too-common "vicious cycle." The typical homeless family, in Hornell as elsewhere, is a single woman with two or three children, he notes. Frequently, a woman snared in this web, he says, will move in with a man who's offering space for her and her kids. Miller believes this amounts to "prostitution for shelter." However one characterizes it, it's not a great option for the woman --- and it sets her up to be the victim of abuse or violence. Why is Hornell experiencing a rise in homelessness and attendant ills? Part of it is geographical, says Miller. The new east-west Interstate 86 (a.k.a. Route 17) runs through town, and the north-south Interstate 390 is close by. "You get homeless transients" added to "homeless from the town itself," Miller says. Then there's the economy, which has hit Hornell and the rest of Upstate pretty hard --- and which may get worse under the pressure of endless war spending and tax cuts for the wealthy. Miller follows this descent step by step: "The K-Mart went under, the Rite-Aid went under, business after business went under... I'm just shy of 56, and I can remember five separate rail lines here." Today, he says, the city doesn't have much left. There are three medical equipment stores, he says, a sign that the community is existing on the retirement income of former railway workers. And there are some bars and clubs. A bit further west, within the gravitational field of Buffalo as well as Rochester, Wyoming County is showing signs of the homeless problem, too. County planner Tom Skoglund doesn't believe the area has a great number of homeless, though. He pulls out US Census figures that seem to nail the facts down --- at least as the facts were on April 1, 2000, the day the slightly faded statistical snapshot was taken. How did Wyoming County look that April day? According to Skoglund, there were 118 "non-institutionalized" people (a catch-all census category that includes the homeless). Wyoming County's total population then was 43,424. So the homeless comprised less than one percent of the county population --- seemingly little, but significant in terms of raw human need. The Washington-based National Coalition on the Homeless, cautioning that a "definitive representation" is impossible, says "the best approximation" is that 3.5 million Americans --- 1.35 million of them children --- are "likely to experience homelessness in a given year." In rural areas, says the group, "the numbers of children experiencing homelessness are much higher" than in urban areas. So there's good reason to think any official number --- like the 118 in Wyoming County in 2000 --- may be a shade low. Alan Bliss, director of the Perry-based Community Action of Wyoming County, says that when 10 or 12 cases of homeless cases are reported countywide, there are probably more like 20 actual cases. He adds that his agency has built nine stand-alone, three-to-four bedroom units for homeless to stay in longer-term. "We have housed 24 families," he says. Back in the Finger Lakes, Marie Milligan, social ministry coordinator for the Roman Catholic Community of Geneva, deals with a factor that might not define the problem of homelessness but nonetheless can't be ignored: personal actions and choices. Sometimes, she says, a group of people "will come to Geneva to party or whatever" and leave someone behind on the street. "Most of the time I give them a bus ticket back home," she says. She adds she might see only five people a year who are actually "sleeping behind the plaza, or in a box, or in a car." Yet Milligan also points to a structural, even political difficulty that put families into real crisis mode: delays in processing. It takes 45 days, she says, for a family to get on "DSS" (now TANF, Temporary Assistance to Needy Families). But if there's been "a problem," she says --- say, a previous denial of public assistance for cause --- the delay might run from 90 to 175 days. So how do people survive in the meantime? The question comes around again to the lack of dependable drop-in facilities. "We don't have a shelter in Geneva," says Milligan, "so we refer them either to Rochester or Syracuse." She points out an irony, too, one that says as much about existing facilities as about the lack of them: "Most people don't want to go to a shelter." McMahon singles out one factor: "Despite what has been touted about welfare reform, the shelter allowance has remained the same since 1998... a ridiculously low amount, frozen in time." The homeless in Livingston County, he says, "aren't living under a bridge or in a subway tunnel." Rather, as across the region, they're existing in substandard or overcrowded quarters. Here it comes again: "There is no homeless shelter in Livingston County," says McMahon. But McMahon passes along some good news, too. His agency leases an apartment in Mt. Morris where a homeless family can be placed for up to four weeks. Livingston County social services, he says, has asked the agency to "duplicate" this project in Dansville. Why isn't DSS there or elsewhere doing this kind of thing itself, instead of pushing private not-for-profits to do the heavy lifting? The not-for-profits, says McMahon, can do "high-quality" work at a lower cost. The push to save money gets ever stronger as the public sector pulls away from providing adequate support. Nan Roman, head of the National Alliance to End Homelessness, says current federal funding, at around $1.5 billion, is substantial. Yet, she says, it doesn't meet the needs out there --- particularly the need for affordable housing. The Washington-based National Coalition for the Homeless provides some data: Federal outlays must cover almost 5 million households "experiencing 'worst case' housing needs" nationwide. And around 90,000 affordable housing units are lost each year "due to demolition or sale of public housing." The net effect: Working families are left out in the cold --- "one thing after another" with no end in sight. Human services groups will distribute food for the needy behind St. Francis de Sales Church, 130 Exchange Street, on Thursday, April 24.